Today, learning happens everywhere, not just in the classroom. But it’s often difficult to get recognition for skills and achievements that happen outside of school. Badges for Languages with Mozilla’s Open Badges technology is working to solve that problem for Language learners, making it easy for anyone to issue, earn and display badges across the web through a shared technical infrastructure. The result: helping people of all ages gain and display 21st century skills and unlock new career and educational opportunities. An open, distributed system for badge validation actually works in a similar process as the existing system in that it requires: standards, evaluation and evidence. The difference is that each piece is open and distributed, versus controlled and constrained. As previously outlined, badges in the Open Badge ecosystem are essentially units of metadata or information. One important piece of distributed validation is simply adding more information to the badge. Badges for Languages is adding an optional field to the metadata specification for URLs to the standards that the badge aligns to. The URLs included convey that this badge aligns with the CEFR for Languages standards and gives those people consuming that badge and trying to understand it’s value a place to go for more information. The CEFR for Languages Standards, is a standard in use by a large majority of Countries in Europe that define required second language skills to teach in schools, universities and academies. CEFR for Languages may very well be a standard that is used within the badge ecosystem but it cannot be the only one, as well as the fact that it is only for a very particular set of skills and it only addresses a limited set of learners (i.e. formal education). But many badges for these learners and skills may be aligned with this standard and thus can provide the link to the particular standard within the badge. Additionally, there are already many competency frameworks for various disciplines and many are pushing for our education system to move in a more competency-based learning direction. This would better align our learning objectives with the skills required for particular professions. Whether or not that turns out to be the direction of choice, there are a lot of people working on these competency frameworks, schools considering aligning with them and employers used to working with them. Badges for particular skills within a discipline could align with one or more of these frameworks and include the URL to the framework in the badge metadata. Of course there is the question of how we validate the validation. It is an open system, after all, so any link can be put with any standard into my badge, whether it officially aligns or not. In the current badge ecosystem, the onus is on the person consuming that badge to evaluate and vet that information, but with badges, they have all of the information needed to make those decisions. This responsibility will probably never go away, consumers will need to do some work to understand badges. That’s actually how consumption of credentials works today, but in fact, it’s steps ahead. Today, an employer gets a flat resume that lists the degrees earned, jobs held and skills developed. The employer must either do some work like calling around to confirm the information (if that’s even possible) or take it at face value, which is most done. Badges offer a more evidenced view into this information because they come with the associated metadata that can be used to better confirm the information represented by the badge. But we can go even further with badges and their distributed nature. The badges are more than technical blobs of data, but are embedded and transferred in a broader social ecosystem. 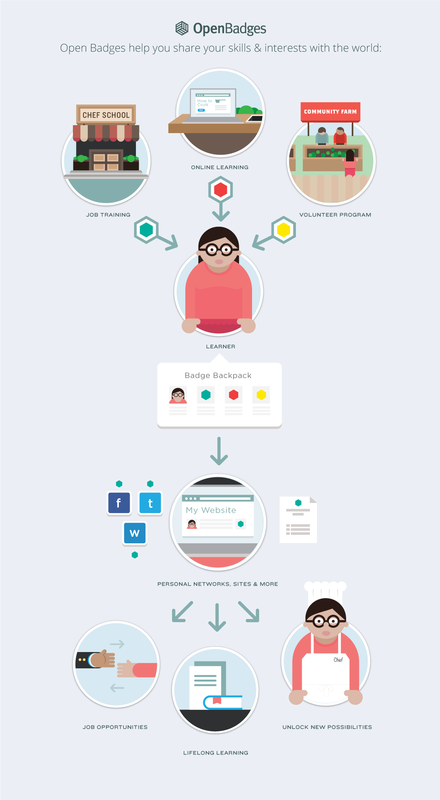 We can leverage that ecosystem for additional social layers on top of the badges, namely endorsement. Endorsement is a trust layer on top of the badge ecosystem and works by allowing third parties to ‘sign’ badges that they approve of or endorse. Endorsement is a key feature of the distributed validation system. It allows human beings to confirm what the badges do in order to meet these standards. A standards body or interest group, for example, could review all of the badges that claim to adhere to their standard or competency framework, thus adding in that extra assurance. But this is a distributed system, so other people could endorse the badge too and it sets us up for a value chain of evaluation, approvals and endorsement. The current system relies on standardized tests to show that the learning goals have been learned and can be used in other contexts, how badges are adopted and used will contribute to the validation. If a large number of badges from a particular issuer or aligned with a particular standard are endorsed by many organizations, accepted as credit or used for hiring, both those badges and the standards used gain perceived value. How badges are used and adopted can add additional assurance to those badges. This requires heavy-duty analytics and reporting that does not exist yet but can either through the Open Badge Infrastructure or through third party tools that will emerge as this ecosystem continues to develop. Similar to the existing accreditation system, the proposed solution for badge validation uses standards, evaluation and evidence to validate learning, but instead of a top-down, closed system, it is open, distributed and bottom-up. The badge validation system involves aligning badges to standards or competency frameworks and including that alignment information in the badge, garnering and exposing endorsements to add assurance and providing public insight into badge use and uptake. This demands both technical and social requirements. A necessary first step is to build the technical capacity into the OBI, including a field for the standards alignment, endorsement functionality and badge analytics and reporting. Those features will set the foundation for this new approach to accreditation, but will not be enough without the social piece. We still need the ecosystem to take accountability for reviewing and endorsing badges. And we still need badge consumers to do the work of reviewing this information. Tools may emerge to make this easier but we will never escape the need for both. Together, we can make an incredibly trusted, powerful and effective system for credentialing. RFC: An Open, Distributed System for Badge Validation.